Deeds is one of three Democrats seeking the party's nomination for governor. 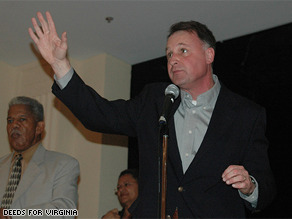 WASHINGTON (CNN) - Virginia gubernatorial candidate Creigh Deeds just fired a warning shot across the bow of local politicos who regard him as something of a third wheel in the state's crowded Democratic primary race. Deeds, a state senator from Bath County, announced Thursday that his campaign raised $600,000 in the first three months of 2009. That might not seem like a large number - until you consider that Deeds was unable to raise money for roughly half that time, because Virginia law prevents state legislators from collecting checks during legislative sessions. More importantly, Deeds now has $1.2 million in the bank. That's more than rival Brian Moran, a former House delegate who has $824,000 on hand, and it's about $1 million less than the third candidate, Terry McAuliffe, a deep-pocketed millionaire with a healthy rolodex of donors from around the country. McAuliffe announced Wednesday that he entered April with $2.5 million in his war chest. "My opponents had twice as much time to fundraise," Deeds said in an e-mail to supporters. "Brian Moran even resigned his seat so he could raise money full-time for his campaign, but it didn't pay off. I now have 41 percent more cash on-hand than Brian." Deeds also raised 97 percent of his funds in the first quarter from inside the state of Virginia, a greater percentage than both of his Democratic rivals. Moran raised 90 percent of his money from Virginians, while McAuliffe raised less than 20 percent from donors inside the commonwealth. Deeds will surely play that figure up as he tries to sell himself as the Democrat with the best chance of beating Republican Bob McDonnell in the fall. McDonnell has not yet announced his first quarter fundraising total. UPDATE: Deeds' cash on hand total includes an $80,000 transfer from his senate account.